Even though it only costs £825, the Toshiba 46XV635 sits in the middle of Toshiba's TV range. This proves just how aggressive the manufacturer is now getting with its pricing – especially as this set has the performance credentials of many 46in TVs costing hundreds of pounds more. The good signs start right away, with a svelte design that combines glossiness and extravagance (in the shape of a luminous Toshiba logo) in elegant fashion. Spinning the TV round uncovers a well-stocked connections roster. Among the highlights are a very healthy four HDMIs, a USB port able to play JPEG, MP3 and DivX video files, a PC port and a JPEG-capable SD card slot. There are also far more features than the price tag would lead you to expect. Meta Brain – the catchy sci-fi name Toshiba gives to its suite of picture processing technologies – comprises Active Vision M100 Pro HD and Resolution+. 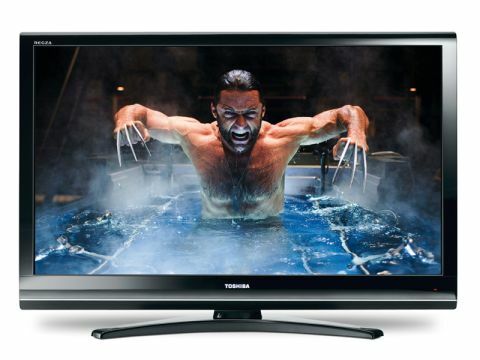 The former refers to Toshiba's proprietary 'catch all' processing engine, with the M100 suffix showing that this TV is distinguished from its cheaper siblings by carrying 100Hz processing for making movement in an LCD image look crisper and more fluid. Resolution+ is Toshiba's proprietary engine – built around technology developed for Toshiba's Cell PC processors – for remapping standard-definition pictures to the 46XV635's full HD screen. There are many tweaks available within the 46XV635's onscreen menus. These include an expansive and sophisticated colour management routine, lots of gamma fine-tuning, two different noise reduction systems and the facility to tweak the effect of the Resolution+ engine on the picture. With minimal effort, you should be able to arrive at a setting you like. Once you do, you should be left with a picture that's one of the cleanest, crispest standard-definition pictures of any 46in set at this price. Unlike some smaller, cheaper Toshiba TVs, this model also loves hi-def, doing a fine job of realising all the picture minutiae contained within any half-decent HD picture. Another plus is that the sharpness doesn't diminish much when there's a lot of motion to contend with. The set's sheer size helps it avoid the accusations of a lack of brightness levelled at some of Toshiba's smaller sets, meanwhile, and its colours are decently intense and mostly very natural in tone. Black levels seem a cut above too, as dark scenes appear with unexpectedly little sign of LCD's tell-tale grey clouding problem. With the 46XV635 also serving up a respectable audio system to accompany its big, bold pictures, this LCD TV easily outperforms its price. There are two little flaws to report, however: a slightly inconsistent backlight and a minor stutter when watching Blu-ray discs using our preferred 1080p/24 output. The backlight issue is so minor that it doesn't affect bright scenes and isn't visible in bright rooms, though, and the twitch only manifests itself during camera pans. But, if you do notice them, they can be distracting. For us, though, neither issue seems remotely a deal breaker when you consider how little this 46-incher costs. Another day, another Toshiba bargain.